Audio accessory producer Master & Dynamic has unveiled new cables for connecting its headphones directly to an iPhone without a headphone jack, with the 3.5mm-to-Lightning and USB-C cables offered at half the regular price for a limited time to celebrate the launch. 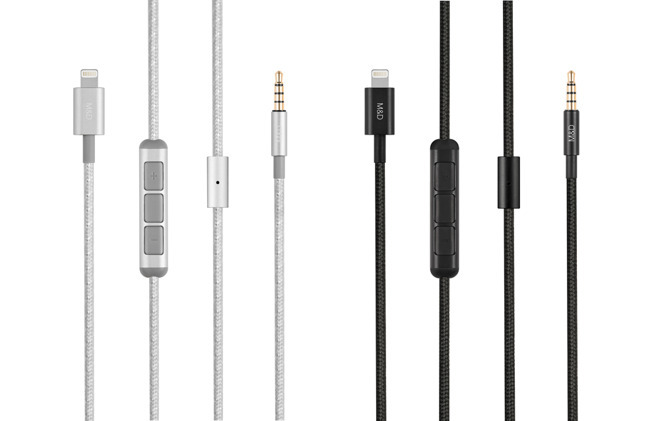 The Lightning to 3.5mm Audio Cable consists of a 1.2-meter (3.9 foot) cord with a 3.5mm plug on one end and a Lightning connector on the other. 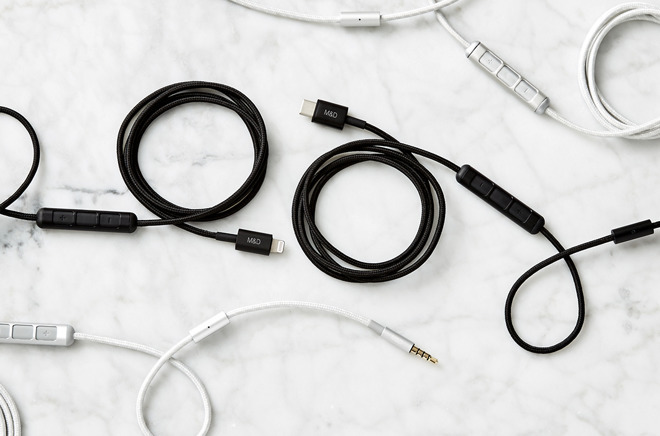 Intended for use with Master & Dynamic's collection of headphones, these cables can replace the standard 3.5mm to 3.5mm cables included with the headphones, allowing them to be used without requiring a separate headphone jack to Lightning adapter. The cables are encased in the same heavy-duty woven fabric as its standard audio cables, which is said to make the cables more durable as well as making them more premium in appearance. The cable includes a built-in digital-to-analog converter, an in-line remote, and a microphone for calls and issuing commands to Siri. While the 3.5mm connection is common for headphones with detachable audio cables, it is unclear if the new cables will work with other brands. The firm confirms it is compatible with its MW60, MW50, MH40, and MH30 headphone ranges. The Lightning-equipped cable is listed as supporting all iPhones since the iPhone 5, the fourth-generation iPad and later, all models of iPad Pro, the fifth-generation iPod Touch and later, and the seventh-generation iPod Nano. There is also a USB-C version of the cable available, which is intended for use with Android devices. Other than the use of a USB-C connection instead of Lightning, they are practically the same in terms of construction and function. Available in a choice of silver and black color options, the Lightning to 3.5mm Audio Cable is priced at $69 on Master & Dynamic's online store, but using discount code CABLE50 reduces the cost down to $34.50 until April 29. The USB-C to 3.5mm Audio Cable costs $49, but using the same CABLE50 code until April 29 cuts the cost down to $29.50.